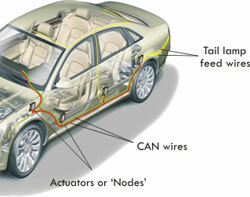 CAN technology will significantly reduce the number of connector pins and wires in the vehicle. With extra ‘blank’ connectors built into the network loop, or with a splice kit for adding connectors, nodes can be added on the production line (or even aftermarket) without running a new wiring harness. However, designers have built in more than one network on the vehicle, linked by ‘gateways’ where appropriate. The mission-critical nodes will be linked on a high-speed Class C network that can operate in virtual real-time. Less critical items, such as the instrument panel, lighting systems will use a slower Class B network, and ‘occasionally used’ body accessories, such as power windows are likely to use a Class A network. *Activated driver assistance systems inform the driver about all relevant data being transferred around the vehicle - the corresponding display is then activated either in the instrument display or on a centre panel display. Computers for engine and transmission control or for lighting system management monitor the vehicle using the data transmitted via the CAN bus. The systems no longer operate in isolation alongside one another, but can now quickly react to the information from one another. The CAN bus is an optimal solution for managing all vehicle electrical and electronic functions. The electronic stability program (ESP) is a further enhancement to the Anti-Lock Braking System (ABS) and Traction Control System (TCS). The ESP is designed to detect a difference between the drivers control inputs and the actual response of the vehicle. When differences are detected, the system intervenes by providing braking forces to the appropriate wheels to correct the path of the vehicle. This automatic reaction is engineered for improved vehicle stability, particularly during severe cornering and on low-friction road surfaces, by helping to reduce over-steering and under-steering. To implement ESP functionality, sensors must be added to the ABS system. A steering wheel angle sensor is used to detect driver input, with a yaw rate sensor and a low-G sensor that measure the vehicles response. Some ESP systems include a connection to the powertrain controller of the vehicle to enable reductions in engine torque when required. When trailers or caravans start to sway dangerously, it is usually a result of the way of driving, speed, crosswinds, road condition and/or, a badly laden trailer or caravan. Caravans and horse box trailers present a special risk. When "snaking" occurs, many drivers display the wrong reaction and under stress, try to keep their tow vehicle and trailer on track by counter steering. This will only amplify the swaying effect and eventually result in an accident. It's about risk and preventative and post-incident actions. The implementation of the system to stabilise the car's travel is post-incident part. To have all those inputs activating a system which responds as if no trailer is attached when there is, is too big a risk and could well be construed as contributory negligence by insurers, expert witnesses and courts. Most people seem to equate adding a tow bar to making sure the rear lights work. It's often forgotten than the whole dynamic of the forward motion is significantly altered. Citroën have gone to great lengths to ensure everyone's safety by incorporating a sophisticated vehicle stability management feature to reduce the risk of unwanted incidents. Dedicated towbar wiring systems are manufactured for specific vehicles and are non-interchangable between models. Developed to perfectly integrate into the vehicle’s existing systems to allow usage of inbuilt safety features and preserve the integrity of multiplexed or CAN-Bus circuitry. It is currently not a necessity to install a dedicated wiring kit, as relay technology kits are available which add towing electrics without disturbing modern vehicles’ complex systems. However there are an ever-increasing number of serious advantages to installing a fully dedicated and integrated towing electric system. As opposed to the traditional, relay technology wiring kits which aim to completely bypass vehicle systems, The read/write function of the CAN-Bus wiring kits means that inbuilt vehicle systems such as Rear Foglamp Cut-off, Parking Sensor Cut-off and – more importantly, manufacturers’ Towing Stability Programs can be used.